TORONTO, February 28, 2014 − Premiers are committed to creating good jobs and driving economic growth through a skilled and productive workforce, and providing Canadians support to contribute to Canada’s economic prosperity. 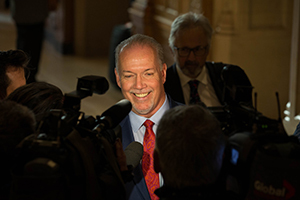 By working together, Canada’s Premiers have achieved a modest number of changes to the federal government’s proposed Canada Job Grant* − changes which minimize the negative impact of the initial federal proposal. 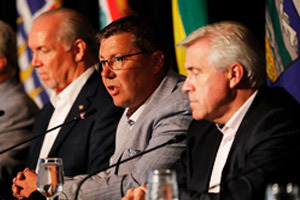 Although Premiers still share important concerns about the design of the Canada Job Grant, they are prepared to move ahead with implementation discussions on the basis of the compromise which has been worked out. In response to provincial and territorial advocacy, the federal government has agreed to eliminate the cost-matching requirement for provinces and territories, allocate a greater proportion of the Labour Market Agreement for existing programming for vulnerable workers, and review the program by the end of 2015 which is a critical step to ensure it is meeting the needs of Canadians and employers. 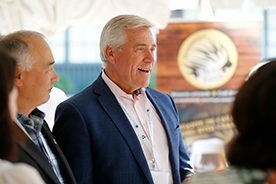 Provinces and territories will now begin work to finalize the renewal of bilateral Labour Market Agreements. 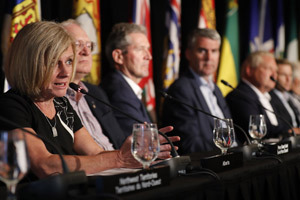 While the federal government agreed to a number of changes to the proposed program, Premiers noted that there remain some significant, outstanding issues. There will be less federal funding available for existing, successful skills and training programs for our most vulnerable and unemployed than under the current program. As well, the proposed program may not be flexible enough to allow some employers, especially small and medium sized businesses, to participate. 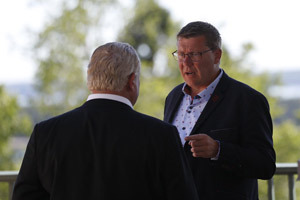 Premiers are concerned that if businesses are not able to use the Canada Job Grant, funding that would otherwise be going to organizations that provide employment supports to vulnerable Canadians would be lost.